I have been setting up a new environment for Windows 10 deployments – SCCM 1702, and Windows 10 1703. When creating the initial reference image and deployment task sequences, I noticed an annoying issue during the OOBE phase of sysprep. 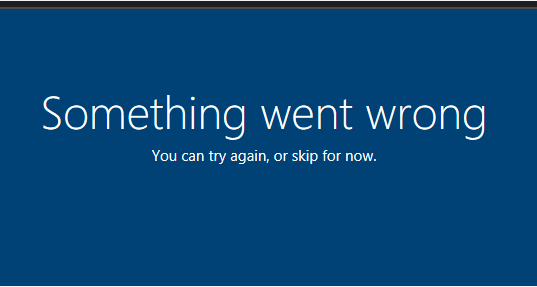 My VM would run through the build, join the domain etc, but at the end of the build an error popped up saying “Something went wrong, try again or skip”. Skipping continues the task sequence and the machine is fine after that. Hitting try again does nothing. This only happens in my deployment task sequence, not the build & capture. As a test, I modified my deployment task sequence to join a workgroup instead of domain, and the error disappeared. Changing back to domain join and the error comes back – however my domain join actually works fine, and there are no errors in the setupact log regarding domain join. In my task sequence, on the Apply Windows Settings step, the default option of “Randomly generate the local administrator password and disable the account on all supported platforms” is selected. I have not made any changes to the unattend.xml file regarding the default administrator account. Changing that setting to leave the account enabled and set a password, did not help. So, at this point, I had tried several things but the only one that made a difference, was making the TS join a workgroup instead of the domain. Since the domain join itself is not failing, I started looking at group policy. I noticed the existing environment had a legacy GPO that was configuring the local administrators group members using Group Policy Preferences. Disabling this GPO fixed the issue. I am in the process of overhauling and hardening the GPO’s in this environment, so I will update this post on how Restricted Groups affects this issue. There is a lot of info out there now regarding this error with various fixes, but since I now having a working solution this update to the post is what worked for me. These were hard requirements for my situation, to pass security audits. Relaxing either or both of these settings has resolved the issue for some people, but was not an option for me. I did test each of these in isolation, and they didn’t work. The install.wim didn’t work with or without the updates, and the unattend changes didn’t work on the previous captured WIM. This current setup appears to be working. Thanks for the info in your post. I had tested OSD with 1703 on my lab. I got this problem on two of our seven models. I don’t have the same GPO preference configured, but I do have Computer Configuration > Policies > Windows Settings > Security Settings > Restricted Groups set to modify the BUILTIN\Administrators group. It is interesting that I only got the problem on two of seven. I plan to unlink that GPO and deploy again. I am also still on ConfigMgr 1610, but I am unsure if that would also cause issues. I can confirm that for me the behavior is the same for Restricted Groups or GP Preferences. I agree that it is odd that some hardware models display different behaviour, but there are definitely some bugs in this build of Windows. I’ve had this issue confirmed with other consultants. It would be interesting to review the SETUPACT and SETUPERR logs on your different hardware models, and also check that your GPO restricted groups settings are actually applying to the models that seem to work. In my testing, this occurs after the task sequence completes, before the logon screen is displayed after the final reboot. So, SCCM does appear to be suspending GPO processing during the task sequence. We’ve experienced this also. What we found was that it wasn’t a restricted group or GPP for the Administrators group, but UAC. Try turning off (setting as “Not Defined”) all your UAC policies and see if the build run through. Alternatively, to confirm that you are experiencing the same as we are, get to the “Something went wrong” screen on a VM you can directly access (not via RDP), and do an alt-tab. You might see a OOBE UAC prompt hiding behind. If I find a solution that doesn’t involve putting the machine in a temporary OU, I’ll post back here. Thanks Craig, I did see the elevation prompt, but this occurred even when those UAC GPO’s are not set. Literally the only GPO being set was the local admin group membership. Removing this fixed the problem. Ok, from our side I can confirm that this is a bug relating to the UAC GPO setting of “User Account Control: Behavior of the elevation prompt for administrators in Admin Approval Mode”. If this is set to anything other than “Not Defined” or “Prompt for consent for non-Windows Binaries” then the issue will occur. My testing showed that the Restricted Groups setting was a red herring. This should be able to be proven by changing from a restricted group to a GPP to Update (not replace) the members of the BUILTIN\Administrators group, which leaving the UAC setting above in a non-error setting. Thanks for the heads up. I tried applying the May Cumulative update to my 1703 WIM and still had the problem afterwards, so it’s probable that that OOBE updated wasn’t related unfortunately. Our support call to MS has had some results. Known bug, to be fixed in a future version of Windows (no mention of whether or not this will be a Feature update or Quality update fix though). Hello CJ, Is it possible for you to share the response from MS, you can remove any confidential information and can share the rest of the stuff. I am sure it will be valuable information where Microsoft themselves agree that this is a known bug and the whole internet is full of people crying about this issue. Hey guys I know its not specifically related to the same error but I am having some strange issues with our Workgroup deploy task sequence in what what I believe is in a similar vein. If anyone has any ideas or further infomation, It would be greatly appreciated.! When you get stuck at “just a moment” – can you alt tab and see if there is a UAC prompt hiding? I have the opposite experience, no issues with non-domain TS, but issues with domain joined when the GPO’s kick in. *EDIT* – I actually have seen it get “stuck” at the Just a moment screen, but in the background the TS is still running, if i check the status logs coming in to SCCM. The TSProgressUI is hidden, but the TS does continue. I’ve noticed this when testing BIOS to UEFI conversion mid-TS with MBR2GPT. That’s whats weird about it. You can’t alt-tab or do anything besides switch it off. I haven’t been able to find anything else where just yet. I am trying an updated build (same reference machine from a snapshot before capture media) that this time round includes the most recent Cumulative Update that came out a couple of days ago to see if that helps. I know that not a lot of people do workgroup only TS’s and that makes it harder to find a fix combined with a new OS, new SCCM + Workgroup = somewhat rare at the moment! If you open the SCCM status message viewer during OSD, and refresh while it’s stuck, do you see any status messages coming in from the machine? I’ve noticed that after setup windows and configmgr step, I will get the “just a moment” screen, but the TS is still running in the background, and I can see that in the status msg viewer. After the next reboot, it goes back to normal – yours may have a failure and be hidden? Try adding a restart in the TS at the point where you normally see the Just a moment screen. I would love to hear if this works for any of you. I will say that today I was able to resolve the issue with the SkipMachineOOBE and SkipUserOOBE set to true, using a non-captured wim file. Yeah sorry about that, the post removed all the tags when I submitted it and wouldn’t let me edit. Here they are without the leading and trailing carats. I’m having a mixture of results. sometimes I see the “Something went wrong” screen and other times I don’t. However I always see the “Alright, you’re connected. Now we’ll check for any updates…” screen. This screen only occurs upon the very first login after the OSD Task Sequence has finished. What I’ve noticed from one of our 1607 Windows 10 clients is that the setupact.log file shows no “CloudExperienceHostBroker.exe” messages during login. I’m now at a stage where I’ve tried all the suggestions I’ve read online and none work, I’m now going to log an MS support call but suspect I’ll be told about the “common bug” and get fobbed off. Let’s see. We’ve gone the support call route. Known issue, will be resolved in the next CB release (so not when 1703 goes CBB). As a side note, setting the supposedly deprecated unattend.xml file settings for SkipMachineOOBE and SkipUserOOBE to false is a usable workaround for us. I’ve managed to fix it in my environment, and it was indeed the group policy issue described above. I had to go back and recreate my base WIM in a build and capture TS. I used an unattend file that only applied some basic settings: Locale/language settings, registered organisation, timezone, and all the skip OOBE settings. I think the issue was where the build and capture VM was being placed in AD when it joined the domain in the TS. It was receiving a few GPOs and one being related to the Administrators groups and I think this must have tarnished the WIM. So, I changed this to an OU in AD that had no GPOs assigned to it. When I come to deploy this WIM in my deploy TS I then apply the image using a different unattend.xml file that includes settings to create a custom local admin account (I didn’t want to include this when creating the base WIM like we used to in case it was causing the issue). As soon as the machine reached the login screen I could immediately see that the setupact.log file looked a lot better than before. I logged in and was greeted with the usual “Hi, we’re glad you’re here” windows 10 screens and not the others. So for those that see this issue please try recreating your WIM and ensure that when the reference machine joins the domain that it is placed into an OU that has no GPOs attached to it. This has been fixed in the July cumulative update. I can confirm that it works. Can you share the actual KB article for that CU as there has been a few CU updates released recently. It doesn’t mention this fix explicitly, but it is in there. The CAB needs to be offline applied to the install WIM for it to work.